With three children and after school activities, there is one night a week where we don't sit down together as a whole family. So, I need a meal that one can eat before practice and the rest of us can eat later without the food getting cold. This recipe solves that problem for me. It is delicious all by itself, warm or at room temperature. It is also a nice side to grilled meats, but the way we enjoy it on our busy weeknights is rolled in a flour tortilla with sour cream, cheese and toasted in a non stick skillet for a yummy burrito. I even make a couple extra for school lunches. Any leftovers makes a nice lunch for me the next day. Serve with a simple salad, some sliced avocado, a good habanero hot sauce then dig in! You will find me saying this a lot, but please feel free to make this recipe your own. If you don't like cilantro (I heard some people thinks it taste like soap) omit it. If you like it spicy then add more jalapeños. I had poblano peppers in the garden so I added them to mine. Use water or vegetable stock to keep it vegetarian. Just make it for you, make it your own. In a small saucepan, combine the rice with cold water. Bring to a boil over medium-high heat. Reduce the heat to low, cover and cook for 20 minutes. Remove the pot from the heat and let the rice stand for 10 minutes without removing the lid. Uncover and fluff the rice with a fork. Set aside. While the rice cooks, set a fine sieve over a small bowl and drain the can of tomatoes. Pour the tomato juice into a liquid measuring cup and add enough of the water or stock to equal 1 cup. Heat the oil in large skillet over medium-high heat. Add the onion and poblano and sauté until soft, 5-7 minutes. Add the garlic and jalapeño and cook or another 2-3 minutes. 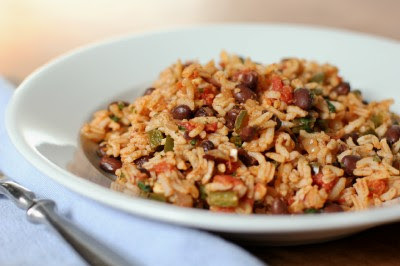 Add the black beans, salt, cumin, oregano and chili powder, and stir a few times to combine. Stir in the tomato juice mixture and bring to a boil. Adjust the heat to maintain a gentle boil and cook, stirring occasionally, until the beans absorb most of the liquid, 5-7 minutes. Add the tomatoes, cilantro and cooked rice and cook until the rice is warm, 1-2 minutes. 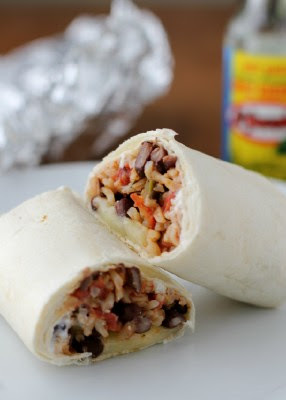 Serve immediately, at room temperature or roll it up in a tortilla. Enjoy! These remind me of a mini Chipotle burrito! This is a perfect recipe for our family. I have three kids and a busy schedule as well that isn't always conducive to us all sitting around the table together. Thanks for sharing! This was delicious! Thanks for a great weeknight meal idea!! I am pleased that you enjoyed it! Yum! I went straight to using this rice in a burrito and it was a big hit with the family. Loads of great flavor! Thank you for letting me know that you enjoyed it:) This is a weeknight favorite in our house. Funny you should mention that someone said cilantro tastes like soap. Lots of people say they don't like it because it tastes like some weird thing. I think it tastes like the smell of old, mildewed rubber dolls left out in the rain. But, in small amounts in salsa, you get used to it.